FRV’s main GUI. The notation symbols on the stave change as you play, reflecting the currently active bowing style. The three dials give visual feedback of vibrato amount, key velocity and MIDI CC dynamics. Kirk Hunter’s orchestral sampling legacy will be well know to those who remember the distant days of hardware samplers and CD-ROMs. His current product line of Kontakt orchestral instruments is joined by Front Row Violins, an all-in-one package intended to reproduce anything from a soloist to a 16-piece section, or any number of players in between. Readers will no doubt be familiar with the concept of multitracking one stringed instrument many times to build up the impression of a large section, and in some ways this is a virtual nod to that technique. It’s not an altogether unique idea for a sample library; others have taken a similar approach, including Kirk himself — notably with his Concert Strings 3 library (see ‘Alternatives’ box). 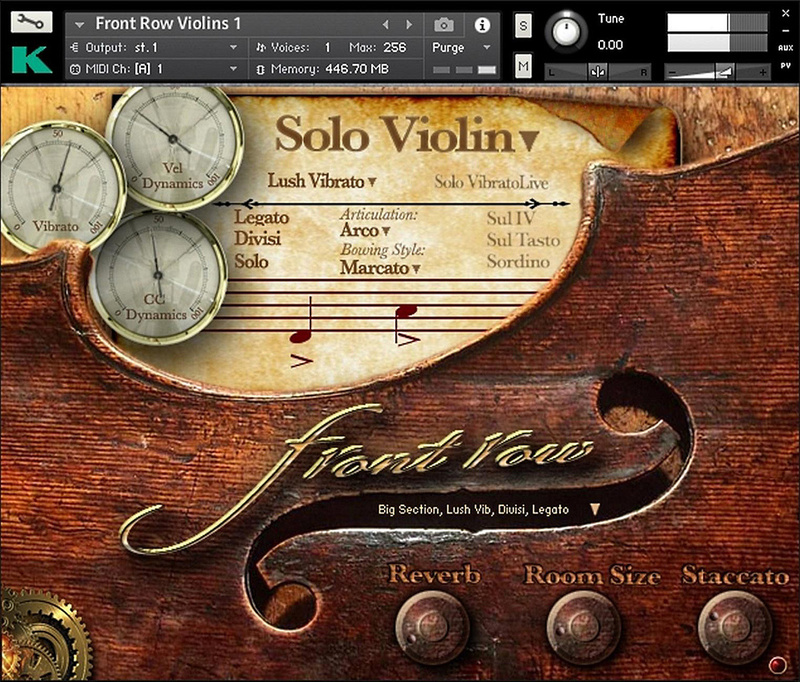 Front Row Violins (FRV for short) comes with two First Violin patches (the main patch and a ‘warm’ version) and one Second Violins patch. Both First Violin patches are identical in functionality, and load by default as Solo instruments. Clicking on the large ‘Solo Violin’ title on the GUI invokes a drop-down menu from where you can select the required number of additional players. The Second Violins differ in that they load by default as a 16-piece section, with two players being the minimum possible — there is no soloist for the Seconds, and they also have a warmer, sweeter tone than the Firsts. The difference between the two First Violin patches is rather more subtle; the ‘warm’ version either has a mere sliver of high end rolled off, or is perhaps based on samples shifted down from higher in the range. But before getting too deeply into any subjective evaluations, let’s take the ‘Front Row Violins 1’ patch as our main reference and go through the features. FRV’s primary performance controls, namely articulation selection, bowing style, legato on/off and divisi on/off, can be operated directly from the GUI panel, but more importantly they are also mapped to keyswitches to enable changes throughout a performance. The eight main articulations are Arco, Tremolo, Half Trill, Whole Trill, Spiccato, Pizzicato, Harmonics and Tremolo Ponticello (played near the bridge). The ninth one, Arco Slur, is assigned to a ‘hot key’, a non-latching keyswitch which applies this articulation temporarily when needed and reverts to Arco when released, giving the options of bowed legato (Arco) or fingered legato (Arco Slur). FRV’s legato appears to employ the crossfade transition method, rather than using separately sampled transitions; nevertheless it works well and, unlike some other instruments that use this method, it sounds surprisingly fluid. Available bowing styles are Smooth, Mezzo Detaché, Detaché, Marcato and Touch Marcato. These each appear to employ increasingly faster attack envelopes in conjunction with an overlaid hard attack layer — again, whatever the process, they do the job. The last of these bowing styles, Touch Marcato, responds to key velocity, covering the whole range from Smooth to full Marcato. Six vibrato styles are provided: Classical, Romantic, Baroque, Celtic, Lush and Western. Rather than being driven by a bog-standard LFO, these are specially scripted vibratos that have a degree of randomness thrown in, giving a less mechanical and predictable effect. By default, vibrato speed, depth and fade-in time are all velocity sensitive, with the added facility of being able to reduce the amount of vibrato once a note has started — more on which later. An interesting option here is Solo Vibrato Live, which only works when FRV is in Solo Violin mode. This puts vibrato speed and depth under manual control, using the C#3 key as a trigger. Repeatedly triggering this key adds a (pitch negative) fluctuation — the harder and faster you trigger, the deeper and faster the vibrato. Additional effects include Sul IV (forced playing on the G string), Sul Tasto (playing on or near the fingerboard) and Sordino (with mute). All three of these are simulations achieved using EQs or filters — their effects are fairly subtle, and arguably not accurately representative of their real-life counterparts. I feel the differences between these effects could have been more demonstrative, in particular the Sordino. One other issue with the Solo Violin that needs attention is that legato note transitions become excessively loud when activating Sul IV via a MIDI controller. 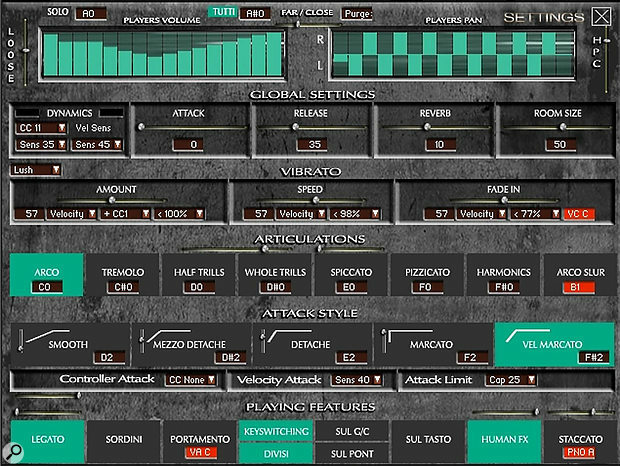 Also on the main GUI we have a drop-down menu of 18 presets, comprising Big, Chamber and Small sections with several Legato, Divisi and Vibrato variations. Convolution reverb is provided (one type with no alternatives) with level and room size controls; interestingly, inside FRV’s resources folder I found four variations of long room reverb. It is possible to select these from inside the convolution reverb’s editing window (as long as you have the full version of Kontakt), so it’s not clear why they’re inaccessible from the GUI — perhaps Kirk just decided to stick with the one he thought worked best. There’s also a Staccato on/off button that effectively mutes the sustain portion of the sound, isolating the attack samples; this can be activated on the fly via a hot key. The accompanying knob adjusts the length of the Staccatos. The final elements here are three steam punk styled circular gauges, giving real time visual feedback of vibrato, key velocity and MIDI CC dynamics levels. Accessed via the brass cogs on the main page, the Settings page provides options for customising how FRV responds to your playing. At the top are two 16-segment bar graphs; the leftmost one is where you can add or remove any of the 16 players and set their individual levels. The first bar represents the soloist, and is always present. The panning position of each player can be set with the bar graph on the right. The overall tightness of timing between players is set with the Loose slider, while the HPC slider affects the amount of ‘pitch hunting’ that occurs at the very beginning of new (ie. non-legato) notes. A reasonable amount of both these parameters helps to add a sense of human randomness when multiple players are active. The Settings page, where the current state of FRV is constantly on display. The number of players, their levels and panning positions are set in the two bar graphs at the top. Vibrato and volume dynamics control can be customised here, and keyswitches reassigned to custom locations. Two additional features visible only on the Settings page are Portamento and Human FX. 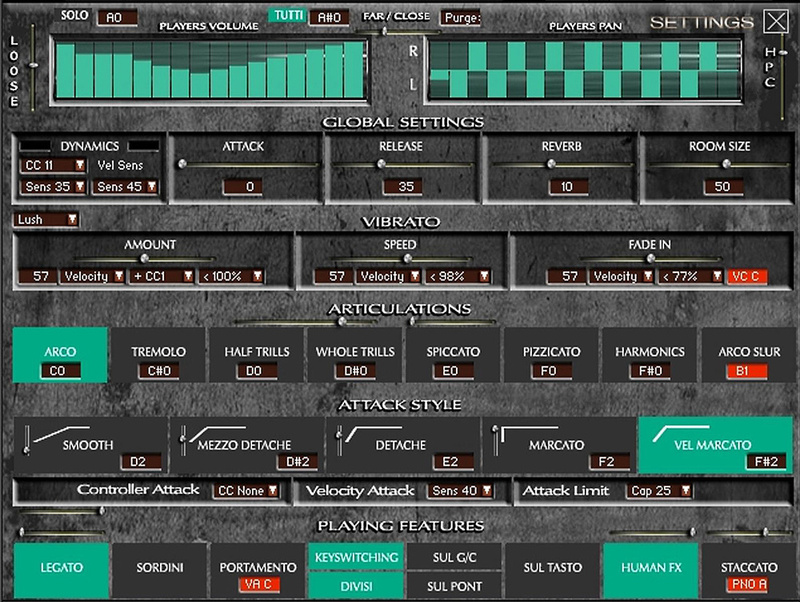 Portamento is a scripted simulation, triggered via a hot key, applying an upward or downward slide from the previously played note; its speed is controlled to a small degree by the velocity with which you hit the hot key. Human FX is described as adding bow change noise to some articulations, and the sound of left-hand fingers hammering on the fingerboard during slurs — both of which are certainly subtle, and hard to discern even on headphones. Amongst the remaining parameters are ways to customise dynamic response, attack and release envelopes, plus various options to control the behaviour of vibrato depth, speed and fade-in time. Keyswitches and hot keys can also be reassigned to wherever you prefer. One especially nice detail is a slider to change the time it takes trills to engage; the length of the Spiccato articulation can similarly be adjusted here. I found FRV’s default performance setup problematic for various reasons, in particular the way in which it responds to dynamics. Dynamics are controlled by a juxtaposition of key velocity and MIDI CC (the default is CC11, but it can be reassigned to any other CC number). FRV’s default setup relies almost entirely on velocity, with only a very narrow range of variation coming from CC11. This is appropriate for shorts (pizz, spiccato, staccato) but is far from ideal for the sustained articulations which will only sound natural when their dynamics are ridden from pp to ff with a MIDI controller. With the default settings, it was almost impossible to play lines where notes were relatively consistent with each other in level, and the limited CC11 dynamic range provided no useful amount of shaping. Adjusting CC11’s range to 49 (out of a possible 50) and key velocity range to 25 produced a more manageable, even response, but at the expense of the shorts, which then needed CC11 up high to hear them, and with precious little dynamic control via velocity. What’s needed are separate sets of scripting rules for longs and shorts, so that shorts are only velocity controlled, and longs respond only to a MIDI CC. Although the full CC range of 50 goes down to silence, it does so abruptly and ungracefully with much zipper noise at the exit point, so is best avoided. There is, however, a more critical issue with the dynamics: there is no gradation of samples from pp to ff (see the ‘One Player Or Many?’ box). This means that dynamics affect only the volume of notes — there is none of the essential timbral variation that provides so much of a stringed instrument’s expression. In cases such as this, my workaround (which can be surprisingly effective) is to pop in a 1-pole LPF as the last Kontakt insert effect and assign its cutoff frequency to the same MIDI CC as the volume dynamics controller. Unfortunately this doesn’t work with FRV — not only does it require sacrificing the last EQ in the insert effects chain, but it has little or no effect, presumably because access to the signal path to this insert is controlled within the KSP scripting. Nor will adding the LPF to Kontakt’s main output work, as effects placed there cannot be MIDI controlled. As mentioned previously, vibrato speed, depth and fade-in time are controlled by key velocity. Once the vibrato kicks in, it can be further controlled by the modulation wheel, so not only can more vibrato be applied, but it can also be reduced — a neat feature I haven’t seen before with ‘automatic’ vibrato. To reduce vibrato you have to move the mod wheel up until it matches the existing vibrato amount and then move it down, which is fairly logical to avoid sudden jumps. However, starting a note with no vibrato is less easy as you have to very swiftly move the wheel from top to bottom fractionally after you’ve played a note. Fortunately FRV allows you to assign manual control of vibrato to any CC of choice, rather than key velocity. When it comes to long sustains, I personally prefer to have as much as possible under MIDI CC control. Assigning dynamics, vibrato depth and speed all to the mod wheel provides a much more naturalistic means of expression, and certainly breathes some additional life into the Solo Violin. I can’t help feeling this library’s main selling point, the Solo Violin, is let down principally by the absence of any dynamic timbral variation, robbing it of its most crucial means of expression. Although multiple dynamic samples can create phasing and doubling problems for solo instruments when crossfading between layers, a reasonable compromise would have been just two dynamics, pp and ff, making use of Kontakt’s much overlooked AET filter to morph between them. Elsewhere, the trade off between velocity and MIDI CC-controlled dynamics (as implemented in FRV) brings its own problems when switching between sustained articulations and shorts. The most successful aspect of FRV is when using multiple players, the more the merrier — they’re capable of delivering grand, sweeping melodies with a stirring appassionata vibrato, and adapt well to polyphonic playing thanks to the nicely implemented divisi. One final point not discussed up to now because it’s so highly subjective, is the tone of the Solo Violin. As with any expressive instrument apt to prominent exposure, everyone has their own concept of the ‘ideal’ tone, and in this regard FRV is likely to divide opinion. Since words are invariably inadequate in these cases, I’d recommend checking out the audio demos on Kirk Hunter’s web site to hear FRV in action. The Kirk Hunter catalogue has three other string libraries offering section-building: Spotlight Solo Strings (from one to four players per section), Chamber Strings 3 (from two to four players per section), and Concert Strings 3 (from four to 16 players per section). Chris Hein Solo Strings collection covers violins, violas, velli and basses, and also includes section-building of up to five players. Chris Hein Ensemble Strings also offers similar voice stacking, but no solo instruments. Performance Samples Solo Violin Legato is worth a mention — it’s very basic with only one playing style, but simple to use, sounds very good (subjectively, of course) and best of all, it’s free. There is no information in the documentation about whether individual players were used to construct the multi-player sections. Is it just one player sampled many times, or different people with their own instruments? Curious to get to the bottom of this, an examination of the key mapping seemed a good way to shed some light. Selecting each group in turn, clicking on individual zones and inspecting the sample names revealed interesting results. Some groups’ samples are named generically, eg. violin_15_nv20, whilst others have peoples’ names attached, eg. Maggie, Wolfgang, Ulbricht and Loretta. Soloing these groups in turn also reveals each one to have a different tonality, suggesting there are indeed different players involved. Elsewhere, careful placement of zones ensures no two identical samples are ever played at the same time. A close look at the mapping of the solo violin shows what appears to be 12 velocity layers for each key split, but is in fact the same group of four samples (a different group of four per key split) repeated three times across the velocity range, presumably to introduce pseudo-random tonal variations according to key velocity. When using multiple players, divisi voice assignments behave differently depending on whether legato is active or not. When legato is on, chords can still be played, with the number of players being divided as evenly as possible between the number of notes; any additional new notes kill all previously sounding notes and redirect all players to the new note. Polyphonic parts therefore need all notes to be released before playing the next chord. On the other hand, turning legato off allows for polyphonic parts with leading voice lines, with divisi always following the number of notes with commendable accuracy. If you release any notes from a chord while still holding others, the freed voices are redistributed evenly amongst the remaining notes, keeping the size of the ensemble and its volume constant — it’s a very well thought out system. Turning both legato and divisi off allows for polyphonic playing with the full ‘bloat factor’ of compounded voices — not necessarily true to life, but with all 16 players active it does sound rather good. Creates any sized violin ensemble from 1-16 players. First and Second Violin patches are included. Divisi is very well implemented. Sampled at only one dynamic. No dynamic timbral variation, only volume — which seriously restricts expressive potential. Awkward implementation of velocity versus MIDI CC control of volume dynamics. FRV is a violin ensemble builder with Solo Violin as its main feature. Multi-player ensembles benefit from a well-designed divisi system. Despite some interesting performance features, the expressive potential of the Solo Violin is hampered by the single-dynamic samples and the lack of any timbral control.